For virtualization workloads and mission-critical tasks, your datacentre will benefit from the highest performance available with the Dell 3U and 4U rackmount servers. The high-availability four-way Intel and AMD systems provide the reliability and performance required for your corporate environment, the ideal platform for RISC migration into the x86 world. Designed to be the perfect all in one systems, Dell PowerEdge 4U servers consolidate your server infrastructure into a singular chassis prepared for the most demanding tasks whether it be virtulization for large corporations or mission-critical databases allowing all of your business requirements to be run by a single workhorse server minimizing co-location costs. With affordable 4U rack mount models such as the Dell PowerEdge R910 featuring a more modern Intel VT-d architecture with up to 40 CPU cores and PERC H700 RAID control for SATA and SAS SSD or HDD storage drives, stepping into the HPC world is achievable. Throughout the Dell PowerEdge range, chassis feature tool-less access for easy maintenance to minimize downtime, the R910 is no different. 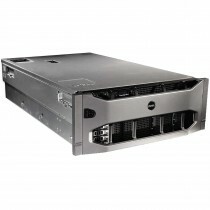 The 12th generation Dell R920 ups the DDR3 RAM capacity to 6TB and processing capabilities to 60-cores with the addition of the PERC H730P controlling up to 24 x 2.5" SAS/SATA SSD or HDD high performance drives alongside 8 front-accessible express flash NVMe PCIe SSD bays. A full range of pre-configured and configurable, new, used and refurbished Dell 3U and 4U rack servers can be found below and the description pages for the most popular systems to the left. For assistance with your purchase send a mail, use the live chat facility or just pick up the phone and call +44 (0)1254 878801.